Remembering Faces.. . . // . Offering Portraits for those interested in being De-faced. . .. . .. /. / . I will be offering to do your portrait on slate.. .. . Just send me some pictures.. . . /. / . The portraits are going to be 22 x 50 cm on slate tiles and £30 each £40 including P+P .. . . if you want to send me some potential photos and i will ruin your face. . .. / ./ . Bigger slates are available on request . . . ././. Rock N’ Bowl.. . . . ./. /. …. ////. As promised photos of the wall space painted at the ever so wonderful Rock &bowl Hostel … / .. / thank you so much for the space . . …. ///. Dead Air Space.. ./. /.///. ‘Dead Air Space’.. . …. . /./…//. 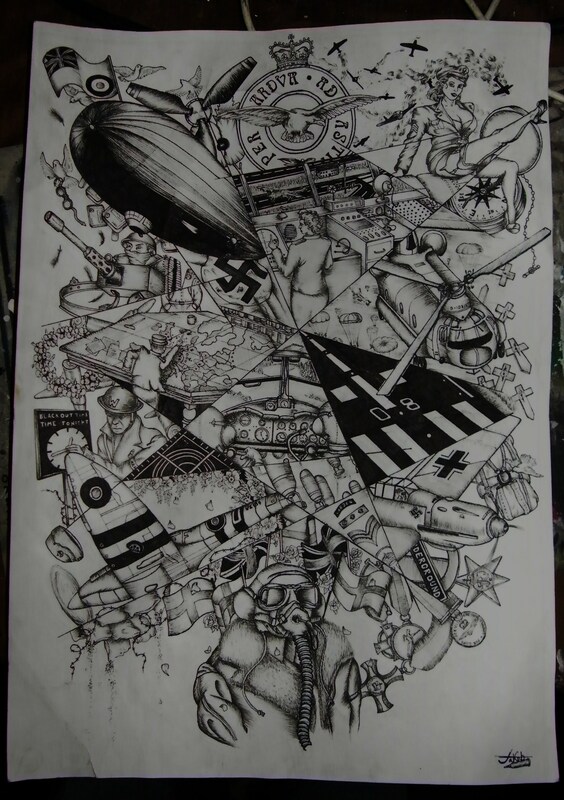 . . As with all ‘Explosions’ this will be available in a limited edition print A3 limited to 100 £40.. . .//./. 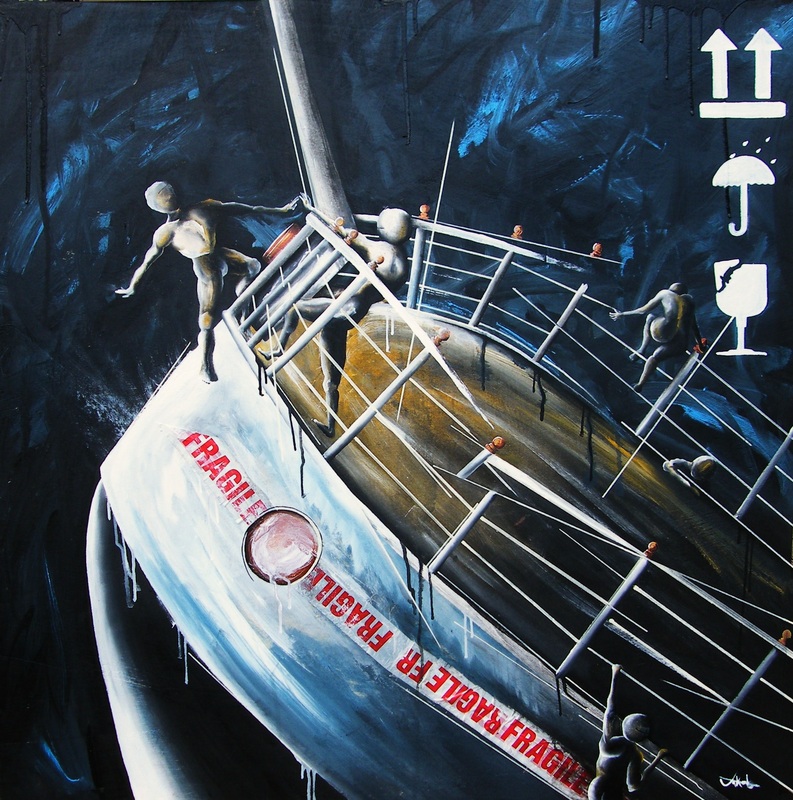 Another Sinking Ship. . …. . / . / . Apologies for the terrible photos, but its there and i’m very pleased.. . … / . / . ‘Retracing The Unsinkable’.. . .. . . .. / ./ . A while back on a freezing winter night a very close friend of mine was putting on a show in the monument gallery castle in Southampton, right at the last minute he need to find a photographer.. . . and well i have a camera and i liked the acts playing so i was chosen. The venue its self was enough of an excuse to go along but the bands on the bill were all fantastic too. The head-liner who i was especially enthusiastic about was Franz Nicolay previously of The Hold Steady. I’d seen and met him once before but that as only in passing, So i knew i had to go. Though the heating in the venue had packed up by the time the show started the whole evening flew by in a blizzard of sub zero temperatures and snow white smiles. Everyone had had an awesome evening shouting along in a castle and i had got thousands of photos. Upon arriving home post gig i started reviewing the photos, i noticed that Franz was a hard man to capture still. I had quite a good collection of blurred faces, i decided to keep them for future reference. I later forgot about them and carried on painting as i normally would. Got That Sinking Feeling.. . …. . . .. / . /. 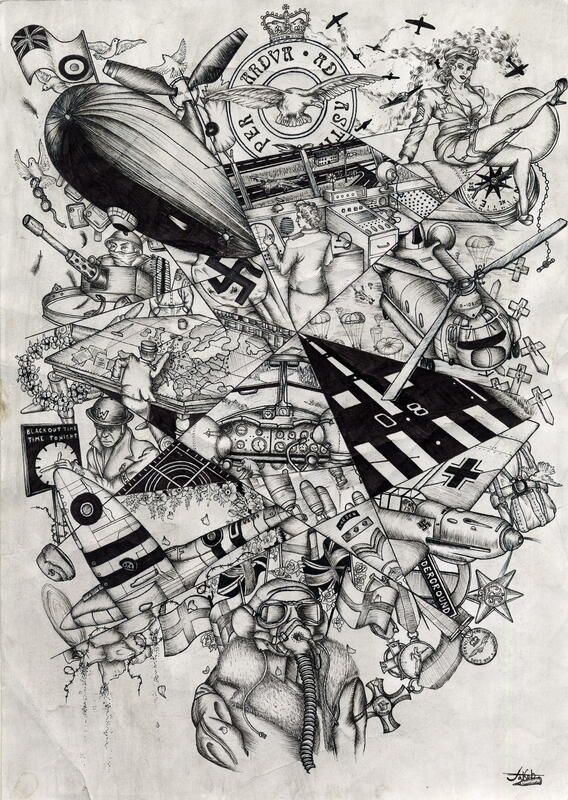 This week i have been exceptionally busy working on explosion drawings but I’ve also managed to squeeze this piece in and will be getting ready to submit it to ‘Retracing the Unsinkable’ Southampton City Art Gallery’s Open Exhibition 2012 Remembering the Titanic .. . …. .. .. . .. ./ . . /. Wish me luck.. . …. . . . / . /. Last min xmas.. . …. . . /. There’s also plenty of other bits. . .. . /. 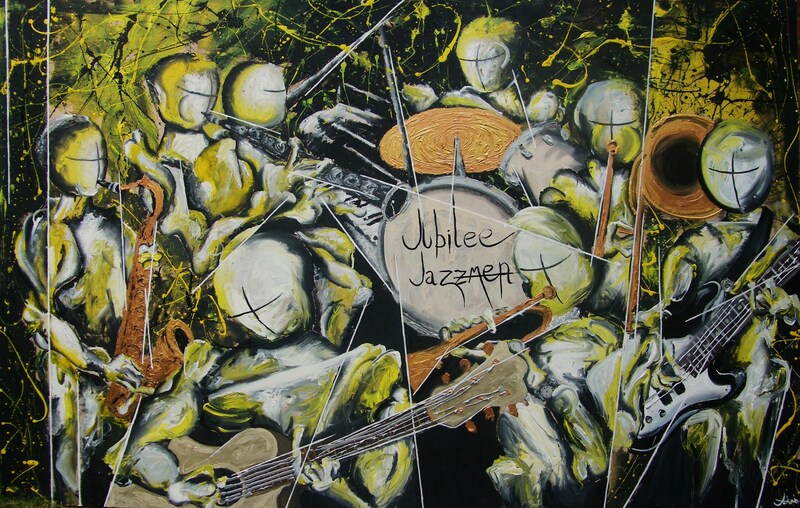 Jubilee Jazz. .. …. 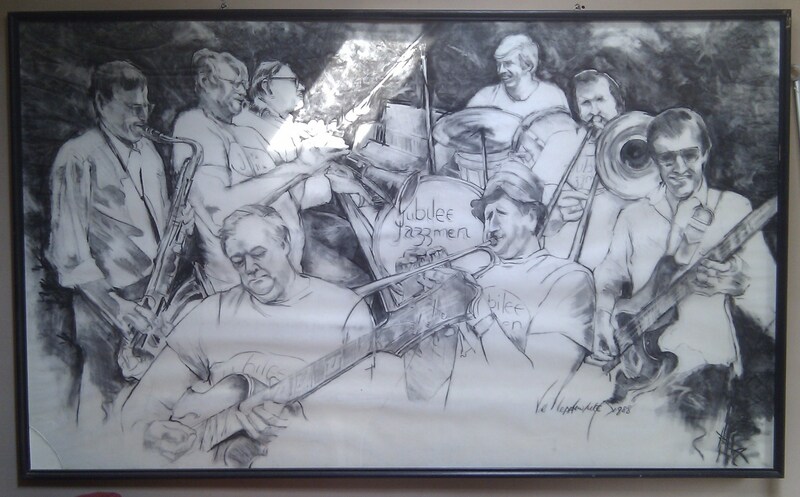 . . . .
As some of you may know from previous posts my Grandparents had this charcoal drawing up for years which a close friend of theirs had drawn for them, They were huge jazz fans and I never really got it as a kid jazz or the picture, As is with everything in life that inevitably changes. The original drawing in question has ended up in my living room and is due to change hands again. Truth be told i don’t want to see it go but its out of my hands, Which has left me with a very large void so i decided to do a scale painting of the exact piece, Here’s the original and my version below. .. .. … . . . . Dedicated to Brenda Steege. .. .. . . .